Yes I said it. It’s time to fry some fish. What say you?-‘You can’t fry fish on the Paleo Diet’? Says who? One of the most important concepts that I want to share to anyone considering the Paleo Diet is that it does not have to be as hard as you think. In general, there is a transition that some people go through when they are adopting the Paleo Diet. Step 1-Read the Paleo Diet Book and think that you have to be as strict as Dr. Loren Cordain is. Step 2-Get scared and fear that you can’t keep it up. Step 3-Start to cheat because you assumed that you were doomed to fail. Step 4-Give up. Well I do agree that reading the Paleo Diet Book is a great way to get started but more importantly it is a great way to learn the science and health benefits behind eating well. Once you understand the principles it will drive you to make the transition. But for most of us mere mortals, once we transition, we will adopt a 50-80% Paleo Diet Life Style and still see vast improvements in our health, skin, emotional balance and weight. By no means am I suggesting that you only take the diet so far. What I am saying is that adopting the principles behind the diet are more important than following the diet strictly. #1-Cook your own food whenever possible. 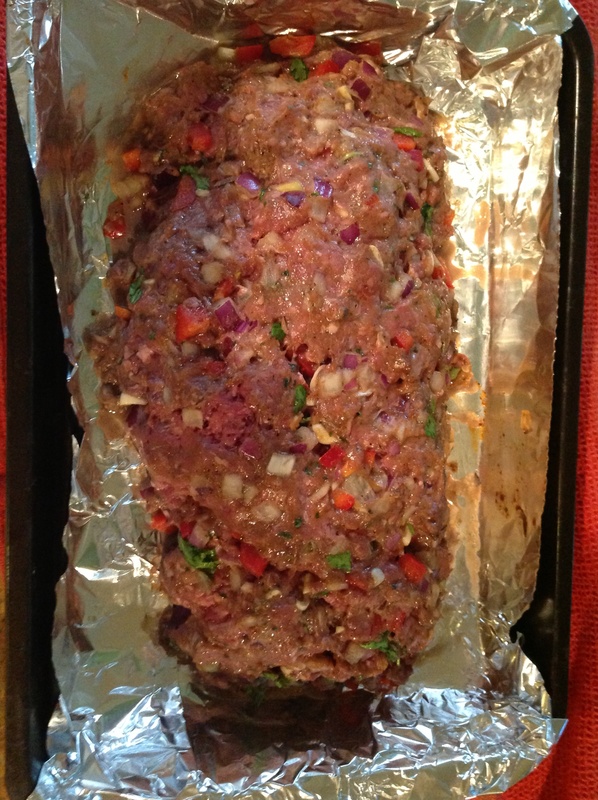 #2-Eat lean meats, preferably organic or at least grown without antibiotics. #3-Rid your diet of sugar and salt or at least vastly reduce it from your diet. #4-Eat vegetables instead of pasta, rice and bread. With these four changes you will see a HUGE improvement in how you feel, your moods, your energy and your weight. Now my next piece of advice is don’t think that you have to drastically change everything you eat. That is the biggest misconception about the Paleo Diet. Instead, consider modifying what you eat keeping in mind the Pale Diet principles. With that said, let’s fry up some fish. So on Friday I was in the mood for fish. But I didn’t want just any fish. I wanted some fried fish. No-I did not completely fall off the wagon. 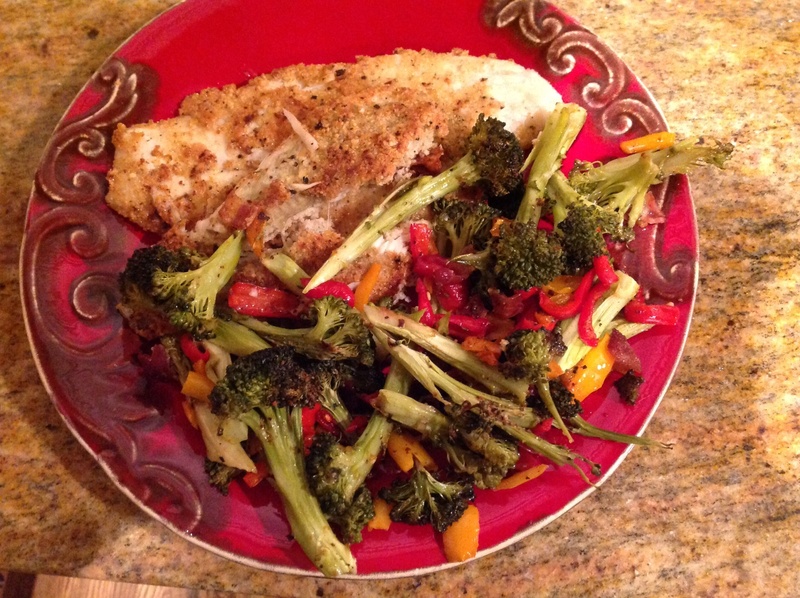 I decided to whip out my favorite fried fish recipe and wow my boyfriend with my Paleo skills! To start, buy some flakey white fish. I usually buy fish when it is on sale at the supermarket. Today I used Plaice (flaky white fish found in the South where I live) but feel free to use any white fish such as catfish, tilapia or whatever fish you prefer. You will need to set up three work stations. 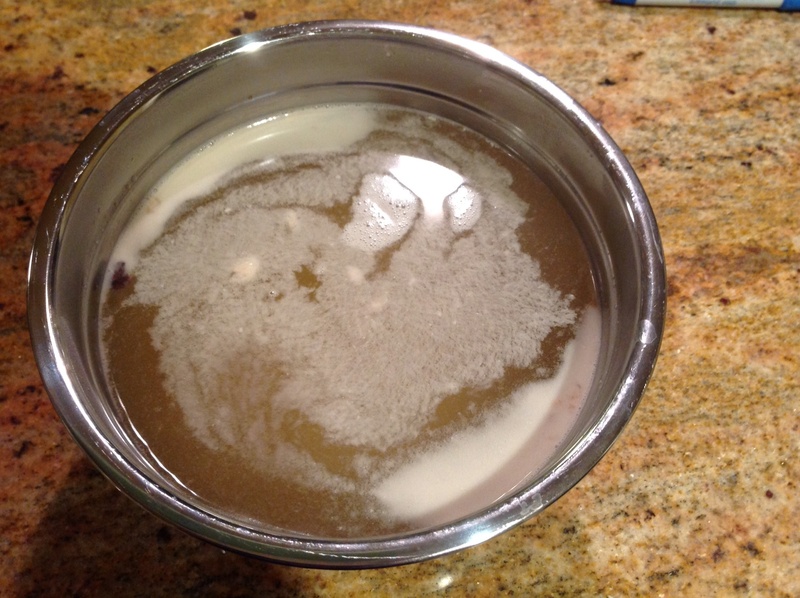 The first station is for the wet prep or the liquid mixture that you will apply to the fish. 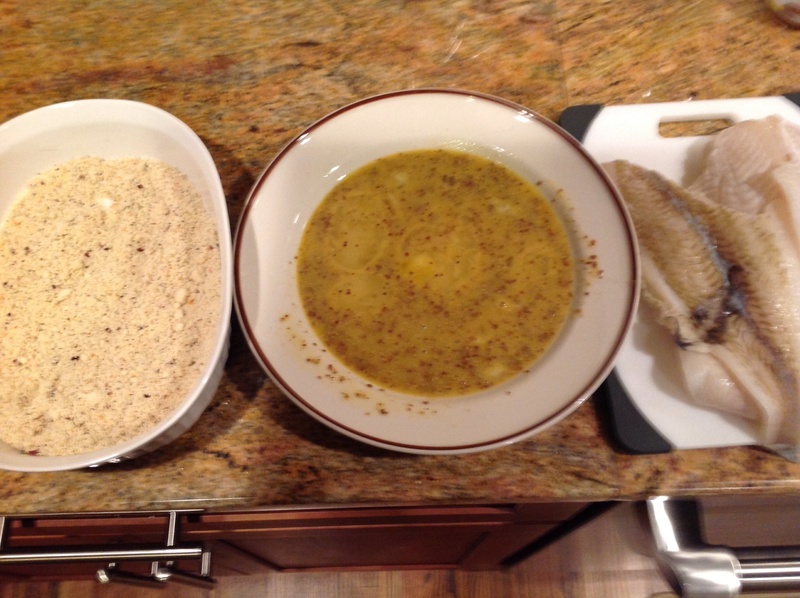 For this mixture I cracked two eggs for approximately 1-1 ½ pound of fish and added three tablespoons of Creole mustard or spicy mustard. I used Zatarain’s Creole Mustard but I have also used Grey Poupon in the past. Mix the mustard completely into the eggs with a fork. In the second work station mix together a dry mixture of three cups almond flour (fine), one tablespoon of cracked red pepper, black pepper and Mrs. 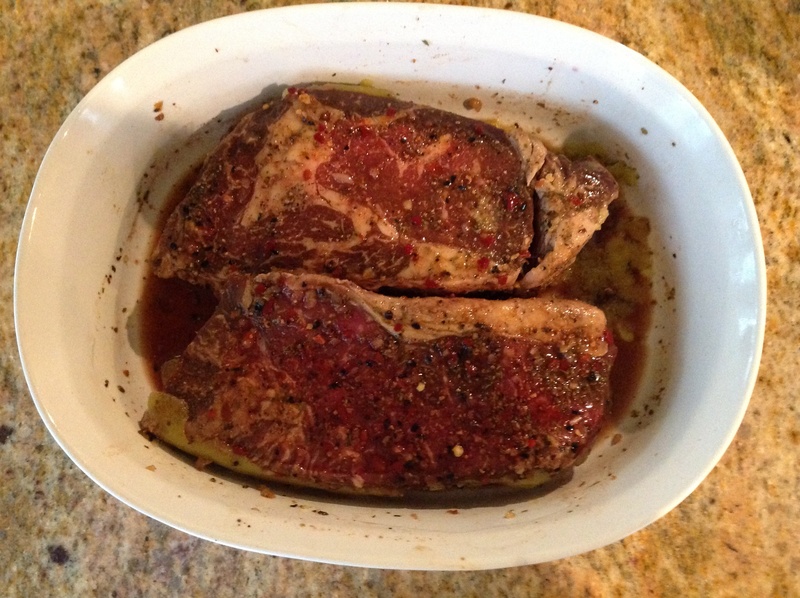 Dash to taste, and a teaspoon of garlic powder. Once those two mixtures are ready, prepare your third work station by placing two tablespoons of coconut oil into a frying pan or cast iron skillet. Be sure to set up an assembly line from the wet mixture, to the dry mixture to the frying pan. Coat both sides of each fillet with the wet and dry mixtures. Then place each fillet in the frying pan allowing each piece of fish to touch but not overlap. Cook each piece of fish on Medium heat until each side is golden brown. Remove the fish from the heat and place it on paper towel to remove the excess oil. 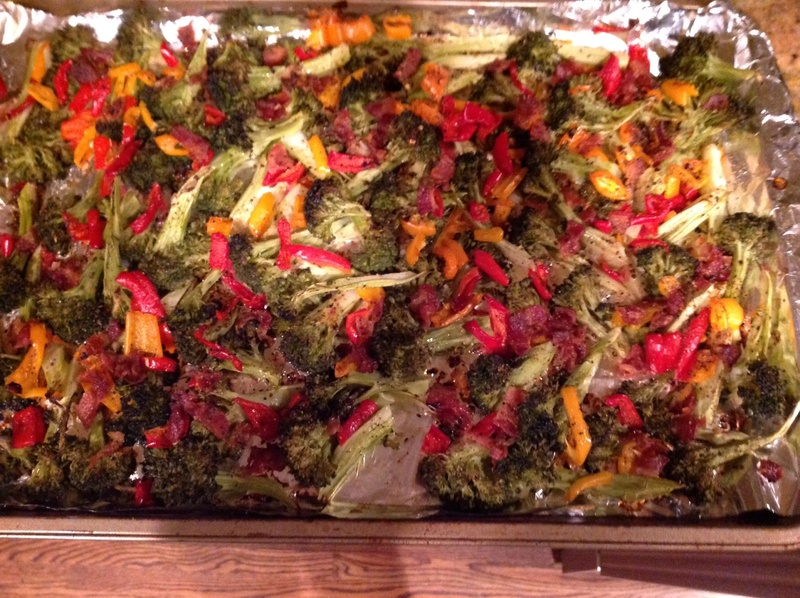 I also baked a pan of chopped broccoli and carrots. Cut up the vegetables and place them flat on a baking sheet. Pour three tablespoons of melted coconut oil on top and sprinkle Hungarian Hot Paprika, black pepper and Mrs. Dash to taste. Cook four pieces of bacon and drizzle the bacon fat on top. Dice the bacon and sprinkle on top of the vegetables as well. Cook the vegetables for 35 minutes or until lightly golden brown. The final dish was delicious, satisfying and very Paleo! I recently was in New York and I had the pleasure of walking through Brooklyn. For anyone who has ever lived or traveled to New York you most certainly have experienced all of the great shops, restaurants and general commerce that is abundant there. One day I passed this fabulous Chinese take out joint that I met before I actually saw it. The aroma from the take-out filled the street and I knew that I had to stop and pick up some beef and broccoli before I went a step further. I thoroughly enjoyed each bite and I realized it took me back to Friday evenings when my Mom was too tired to cook. She would pick up take-out and bring it home in those signature brown bags tinged with oil in the corners. Gosh I remember it like it was yesterday. Well these days I rarely eat at Chinese or Thai take-out joints. Mostly because of the MSG, rice and lack of traceable nutritional value. These days I prefer to break out the wok and make my own Chinese food. When it comes to preparing Chinese food, it is all about taking the same Paleo principals that are used to create any meal and use it in your dish. Start by selecting a lean meat and veges of your choice. Remember, the easiest way to transition to a Paleo Lifestyle is to create the same experiences that you enjoy but with healthful ingredients. As always you have a choice of oils to use when you are stir frying. I often use olive oil but remember that olive oil becomes rancid when it gets too hot which can happen when using a wok. Coconut oil is preferable if you have it because it can be heated at high temperature without altering the oil. Cauliflower has long been established as the best way to “fake” rice so grab a head of cauliflower to use as part of the dish. Simply steam the cauliflower for 15 minutes then transfer it to a cutting board and dice it into fine kernels. At this point you can put it into a bowl until you are ready to add it into your stir fry. Remember that this is a great way to eat your veges so think about your favorite Chinese take out meal and start from there. I personally love broccoli, peppers, mushrooms, bok choy and I pick all or some of those ingredients depending on what is in the refrigerator. Sometimes I like to make my stir fry a little spicy by adding red pepper flakes but I always use Mrs. Dash and black pepper for seasoning. As far as lean meats, I love shrimp, lean steak and chicken and I frequently pick or mix from that list. 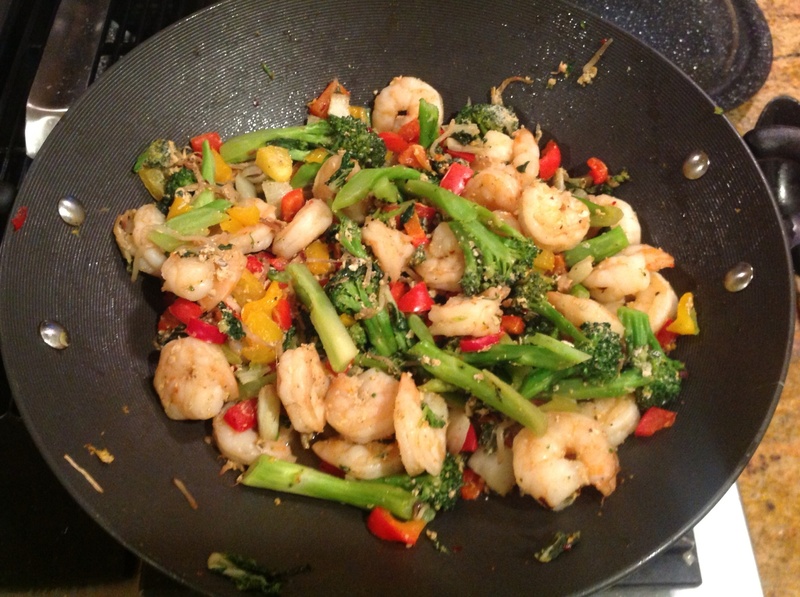 The great thing about stir fry is that you can make many different meals each time yet easily eat Paleo. Lastly don’t be afraid to crack an egg into your stir fry. 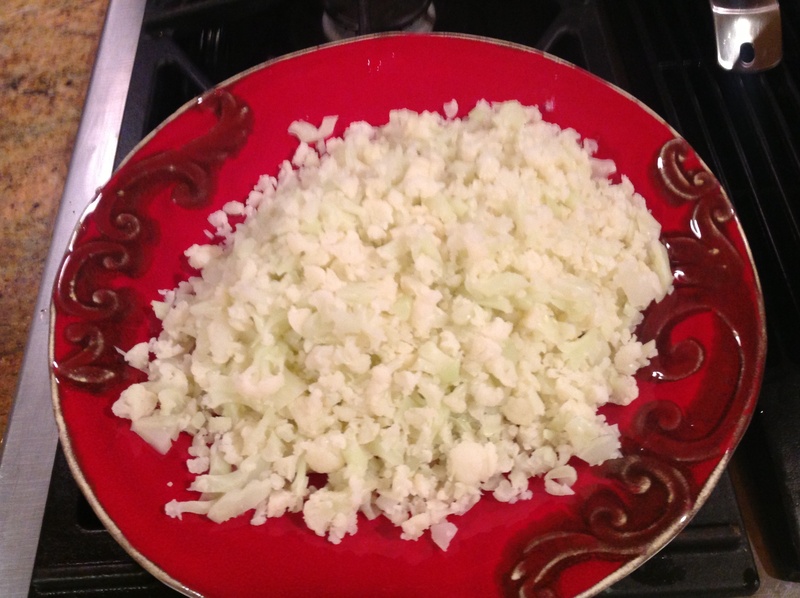 The egg adds protein and creates a lovely flavor when mixed with cauliflower and veges. I have a wok which makes stir frying easy but you don’t have to have a wok to create a great meal. A sauté pan will work well but a wok is an easier way to pile in all of your vegetables, meats, and “rice” in one place while getting it nice and hot. So get started and create a stir fry meal tonight. However, be prepared for the aroma to fill your home and your family to ask you when the food will be ready. No problem, just think of your favorite Chinese take out restaurant and in your most respectable Chinese accent respond with “10 minute”. I just returned home from a birthday cookout at the home of a good girlfriend. Everyone commented on how fit I look and asked me what have I been doing. When I shared with them that I have adopted the PALEO diet lifestyle they asked many questions. ‘What can you eat?’ ‘Are you hungry?’ ‘Why can’t you eat beans?’ And on, and on and on. “It’s simple really, I told them: lean meats, vegetables, fruit, nuts and seeds.” When I told them what the PALEO diet consisted of, they looked at me bewildered by what must have seemed like a limited list of options. For many people I realize that changing your diet can seem overwhelming. We grow up learning what to eat from our families. We learn that to celebrate or make ourselves feel better we have to eat decadent, fattening foods with little nutrition. What that teaches us is that bad food makes us feel good and good food, food with real nutrition, isn’t satisfying. And it is only when people get sick, get fat, or deal with a health crisis that they consider a new way of eating. Unfortunately for most, they go down with a fight. Isn’t it funny how much fun you have getting fat and out of shape, and how painful it is to get fit again? Well there is only one way to change the path that you are on. And that is to start today to do something different to better how you feel, how you look, how you think and how you function in the world. For instance, decide that you are going to do something that raises your heart rate four times a week (Crossfit anyone)? Or, another option may be to decide today that you are going to eat a nutritious PALEO breakfast four times a week. Start somewhere and give healthful eating a chance. Keep it simple in the beginning as you learn more about what works for you and your lifestyle. Make yourself a priority in spite of the children, husbands and wives, and careers that compete for your time. Make taking care of you your number one priority. Start today. Tip: One of the most important aspects of PALEO is the reduction of the inflammatory process caused by eating foods high in salt, sugar, high fructose corn syrup, etc. Reducing your salt and sugar intake should be the first goal for yourself. Early on I learned that many foods that are used to prepare PALEO meals can be processed with added salt and sugar which defeats the purpose. Store bought broth is one example as many brands list more than 500 mg of sodium per serving, one-fourth of our daily sodium intake (way too much!) One trick I learned is how to make broth myself and in turn use it in my meals. 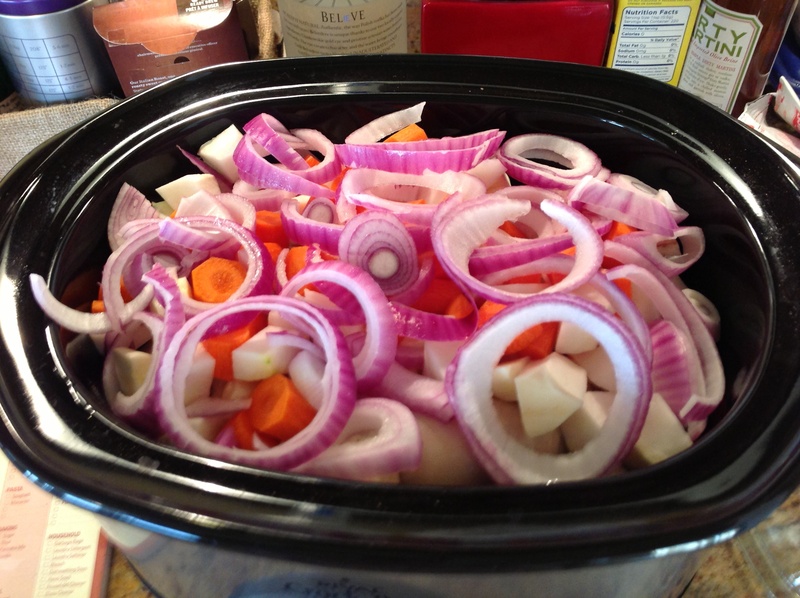 Homemade broth has become one of my most powerful tools to add flavor to my dishes. And the great thing about making your own broth is that you control how much sodium is in it as well! 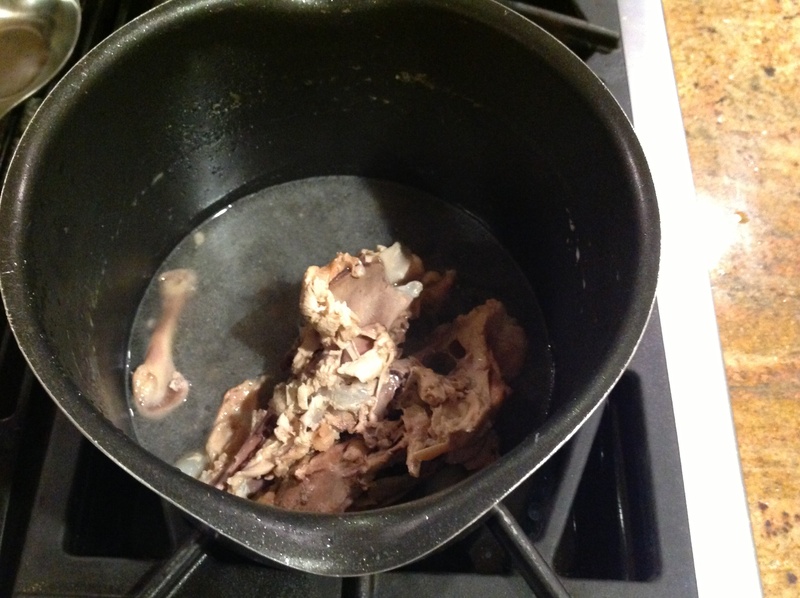 Here is a picture of the chicken broth I made and remnants of the chicken. Now that is recycling! I can use this broth in my cabbage, collard greens, kale or to make chicken soup (minus the noodles). Once it cools I place the broth in a jar and keep it in the refrigerator. It will last up to a week if kept refrigerated. In my pre-PALEO life, Sundays were a day for lounging and rest. I would wake up, decide which pancake house my boyfriend and I were going to visit that day, then overfill myself with pancakes and sausage and hot chocolate. Oh those were the days. I also remember that an hour after I ate, I felt bloated and I needed a nap. Just a little problem of too much sugar and too many simple carbohydrates flooding my system. Now my Sundays are filled with a lot more energy and a lot more food preparation. I can’t rave enough about how much better I feel and look since I started eating PALEO. However, I learned very early in my transition that if I was going to successfully navigate the PALEO diet I had to force myself to prepare my meals ahead of time. There are two rules to following the PALEO diet-1.) You have to make a menu for the week or at least for the first few days of the week so that you can grocery shop, and 2.) you have to prep and cook as much as possible before the work week starts. Today I prepared the chicken in a crock pot, sautéed the cabbage and the butternut squash, baked the meatloaf and the sweet potatoes. Now, that’s A LOT of cooking, however, I am well prepared for the week. I have to pause for a moment to thank my Mom because she alone planned, prepped and cooked full meals for herself, her four children and her husband everyday of my childhood. God bless that Lady! Now, back to PALEO! Feel free to prepare as much as you want but realize that the more you cook and prep ahead of time, the more successful you will be. Once the week starts I will continue to cook on the nights when I get home at a decent hour. For breakfast try to make meals that are simple since we are all trying to get out of the house and start our day. If you have to keep it really simple, boil eggs while you are in the shower, add a piece of fruit or berries, water and your coffee or tea and you are ready to go! You don’t have to follow my exact meal plan however trust me, you have to have a plan. Good luck with your inaugural week. Sugar-Oh how I love you sugar. But oh how I have to leave you alone. I’m sitting at home a few months ago, minding my business when 60 Minutes decides to wreck my good evening. See Sixty Minutes Segment on Sugar. Sugar is addictive? Sugar feeds cancer cells. What in the world? I have to admit, I have long known that something wasn’t right. Whenever I eat sugar my stomach bloats, I ride the high from the sugar rush, then crash when the sugar is gone. SOMETHING AIN’T RIGHT! Enter PALEO! Last year at my box (CrossFit lingo for gym) our Coach challenged us to eight weeks of PALEO eating. Simply put, lean meats, vegetables, fruit, nuts and seeds. I thought, no problem, this is going to be easy. Well how wrong I was. By the second day I could not believe how much I wanted sugar. I cheated so many times during the challenge and unfortunately I did not win-well I didn’t win the challenge that is. However, I won something far more valuable. I remember noticing that on the days when I was able to follow the PALEO diet, I felt better at work and didn’t experience the 10am crash. I felt strong and commanded my CrossFit workouts as my muscles began developing. Something changed within me and I realized that by letting the sugar, the grains, the noodles, the processed foods go, I FELT BETTER! I performed better. I looked better. So over this year I have transformed my eating. Now, I eat PALEO for life. Of course I will have a piece of cake at a celebration or a little mac and cheese from time to time. But I no longer am who I use to be and my body is proof. I am so thankful that I found PALEO because I am proud to say that as I turn the page to my 40th birthday, I am in the best shape of my life. 1.) Upon your agreement, I will provide an overview, websites, and some great menus that I will send to each of you. 2.) We will blog our experiences during the challenge with each other in an effort to support one another and share menus, things we learned, or just have someone to complain to! 3.) We will each pledge to do the following: a.) We will be honest-no matter what!, b.) We will forgive ourselves if we fail and get right “back on the horse”, and c.) We will open our minds and be willing to learn a new way of living that will not only help our waistlines, reduce the tendency in our community towards high blood pressure and Type II Diabetes, improve our energy levels and over all medical health. So if you are ready, let’s do it!